Formerly known as Columbus Day, today is Indigenous Peoples Day in more than 80 (and counting) cities, counties, and states. While “official” recognition of this day began in the late 70’s, with the U.N. discussing the replacement of Columbus Day, resistance and challenge to said “holiday” existed in the hearts and minds of Indigenous and Native Peoples long before cities or states began to observe Indigenous Peoples Day. Across the country we continue to see the violation of our right and treaties as extractive projects are proposed and constructed. Across the nation, we continue to grieve our missing and murdered Indigenous women, victims of violence brought to their communities by extractive oil and mining projects. We continue bear the brunt of climate change as our food sovereignty is threatened by dying ecosystems and as our animal relatives are becoming extinct due to land loss, warmer seasons, and/or contamination. And now, we are fighting for the very right to resist as anti-protest laws emerge across the country, which aim to criminalize our people for protecting what is most sacred to us. Yet despite these challenges, our people and communities are demonstrating incredible bravery and innovation to bring forth healing and justice. Through the tireless work of Indigenous organizers, activists, knowledge keepers, and artists, we are learning about what is working and what our movements need more of to dismantle systems—like white supremacy and systemic racism—that colonization has imposed onto our communities. This term or concept has fallen into the category of buzzwords and trendy topics in social and environmental justice discourse but it is imperative that we break down the silos that keep our issues and movements separate. 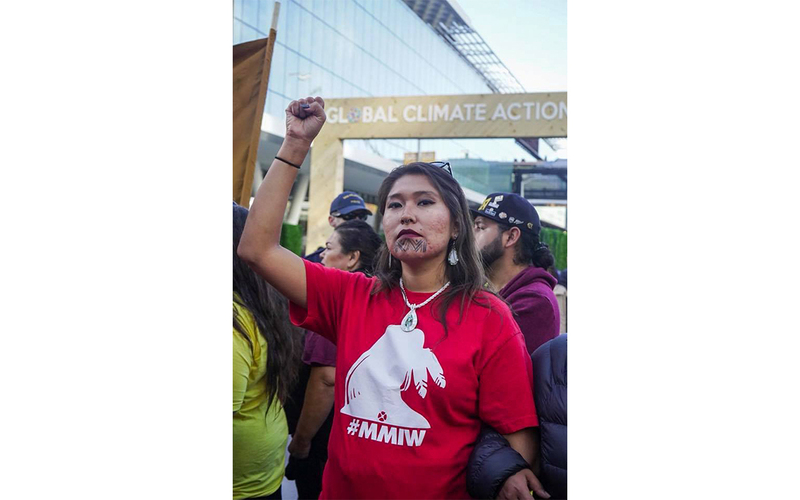 This past September, the Indigenous Environmental Network mobilized in response to the Global Climate Action Summit (GCAS) with the It Takes Roots Alliance, which consists of the Climate Justice Alliance, Global Grassroots Justice Alliance, and Right to the City Alliance. As we challenged Governor Jerry Brown of California and the GCAS for promoting climate capitalism, and as we demanded investment in real climate solutions that honor Indigenous and place-based knowledge, we also built solidarity and unity across races, cultures, and issues, so that as we take on the roots of climate change, capitalism and colonization, we are empowered by our alignment, our diversity, and our respect and trust with one another. In Indian country, organizations like the South Dakota-based Thunder Valley Community Development Corporation are leading the way when it comes to intersectional projects. Not only is Thunder Valley CDC building a model for how our communities can thrive and not be dependent on the fossil fuel industry, but through sustainable community projects, it is addressing housing issues, improving the workforce, and building food sovereignty for its community. 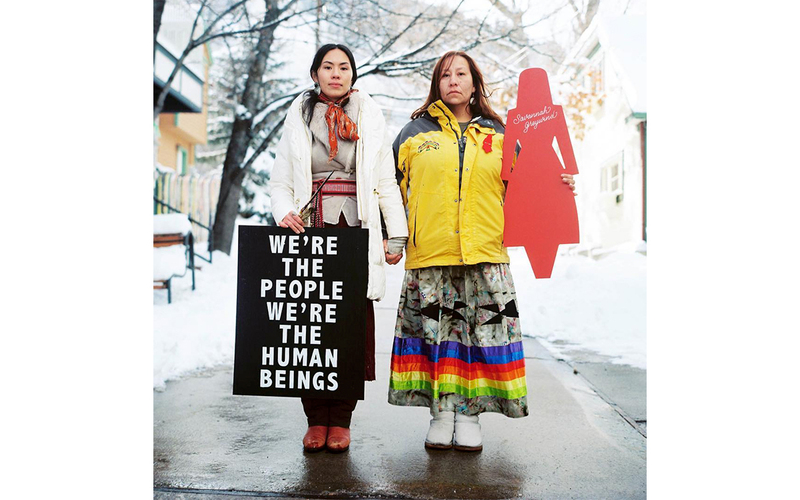 Another project making strides in connecting many intersectional issues is the MMIW Who Is Missing Campaign, which utilizes art to amplify the epidemic of Missing and Murdered Indigenous Women and Girls. The visual project amplifies the absolute necessity for us to take an intersectional approach in addressing the crisis we face as Indigenous peoples. Resource extraction, poverty, racism, and an extremely flawed justice system are all compounding causes that must be seen as parts of a system that needs to be dismantled. It must be said that Indigenous women have played a critical role in showing mainstream society the power that grassroots feminist movements carry when initiating transformative action. From #MeToo to #BelieveSurvivors, we are seeing countless institutions across what is currently the United States being challenged to own their inherent condonement of gender inequity and violence, and to meanwhile witness and accept an upsurge of feminist activism. However, Indigenous feminism goes beyond the mainstream critique of only addressing toxic masculinity and systemic patriarchy—by taking a much broader stance that critiques the overall system of settler-colonialism. At its heart, Indigenous feminism is unapologetically anti-colonial, and we need to embrace that. Indigenous women are demonstrating what it takes to smash patriarchy, to defend our homelands, and to protect our families all at the same time. In the far reaches of Alaska, Gwich’in women have for decades been leading the fight to protect their homelands and the Porcupine Caribou herd from oil development in the Arctic National Wildlife Refuge. Indigenous feminist movements are often the first to identify the intersections of violence, colonization, poverty and environmental injustice. In the bayous of Louisiana, along the U.S. Gulf Coast, Indigenous women have been defending Indigenous and Black communities from the dangers of the Bayou Bridge oil pipeline by blockading construction for months on end. Through direct action and community-based education, Indigenous women leaders are catalyzing our communities and nations to reevaluate what it means to live in relation to Mother Earth and one another. If we are to truly make progress toward building a more just and sustainable society, then we must center an Indigenous feminist framework in our practices. We live in a world shaped by stories. Stories motivate us to build societies and nations. Stories give us purpose and direction. And in this current world, it is a story of white supremacy that dominates. In this story, imperialism is necessary, resource extraction is compulsory, capitalism is inevitable, blackness is demonized, and Indigenous territories must be settled and colonized. Why? Because, the story of white supremacy must be self-fulfilling. Any alternative narratives, such as inherent rights, Indigenous nationhood, and local sustainable economies must be diminished or erased. In this context, we as Indigenous peoples are not meant to exist; we are not meant to have made it this long in the eyes of settler colonialism. As such, simply asserting ourselves in the present and placing ourselves in the future are tremendous acts of defiance to the status quo. 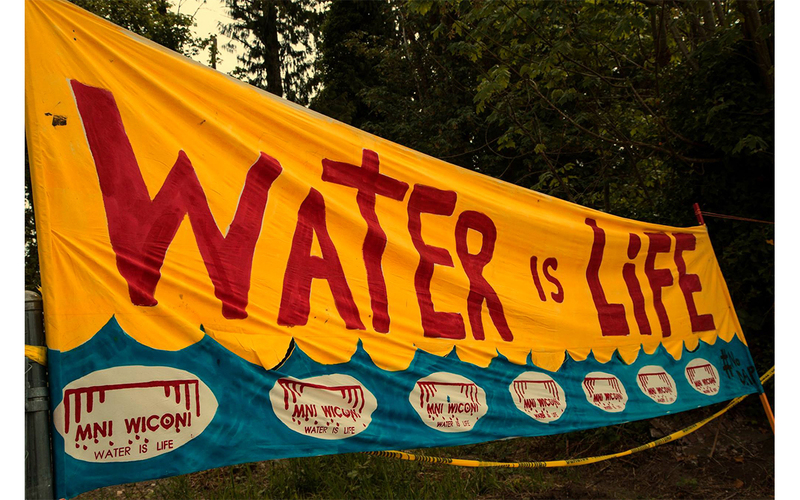 This is what we saw in the Idle No More movement of 2012, wherein Indigenous peoples across Turtle Island took to occupying public spaces to uplift the struggle for environmental justice and Indigenous sovereignty. We also saw this in the open prairies of the NoDAPL fight at Standing Rock, where thousands took action against an oil pipeline project and many more watched the events through the eyes of Indigenous water protectors via social media broadcasts. These events show that Indigenous peoples are not only taking control of our stories, but are challenging the status quo of settler narratives overall. We are changing the story, bit by bit, of what it means to exist in the heart of settler-colonial states like the United States of America and Canada. This is a process. We have all been affected by capitalism, colonization and white supremacy. As such, it's going to take all of us—native and non-native alike—to dismantle these systems of oppression. However, White allies in particular must be held accountable for their role in the dismantling of white supremacy and extractive economies. We need our allies to join us in pushing back against the narratives of colonization and to incorporate the frameworks of intersectionality, indigenous feminism, and indigenous story-based strategies in their allyship. It is incumbent upon our allies to honor the work, sacrifice, and blood shed by Indigenous people in the fights to protect Mother Earth and defend our homelands. As Indigenous peoples, we are powerful agents of change in a time that needs us the most—and our ability to harness an intersectional, feminist, and transformative movement is what will lead us in the right direction for the benefit of all life on this planet. Let’s cherish that. Let’s honor that. Let’s build on that. Jade Begay (Diné and Tesuque Pueblo) is a multimedia artist working with the Indigenous Environmental Network (IEN) as the Communications and Digital Director and the Senior Producer at Indigenous Rising Media, a media project of IEN. Prior to IEN, Jade worked with 350.org as the Multimedia Producer and with Resource Media, as the Justice and Sustainability Communications Fellow. Jade is a graduate of Naropa University (MA Environmental Leadership) and Columbia College Chicago (BA Film and Video). Currently, Jade is co-directing “Blood Memory Experience,” a VR/AR project that explores the connections between identity, land and storytelling. Dallas Goldtooth is the 'Keep It In The Ground' campaign organizer for the Indigenous Environmental Network.